I think it is really important to continue to make deposits into each other's love accounts. Since I have been dealing with cancer, my withdrawals are definitely higher than my deposits. Until the new "girls" come though, I am going to have to continue the withdrawals. I hope someday to be able to repay Bob for all he has done! an insulated picnic bag. The bag is made by Picnics at Ascot and you can visit them here to see all their wonderful bags and baskets. Ours has a place for a wine bottle, a cutting board, dishes and cloth napkins. LOVE IT! Bob and I try to go on a weekly picnic during the summer. This bag will continue to give and give and give! I can't wait to use it on tailgates, too! A happy marriage is a thing of beauty!!! I loved hearing all this, Terri. Terri, this one made me misty eyed. 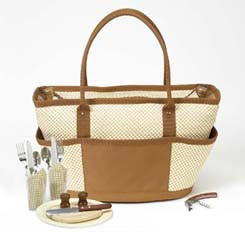 Love the picnic bag and will check out this site. Awwwww...a man who cooks and takes such good care of you and gives great gifts! He's a keeper for sure. Now that is incredibly sweet, and very much deserved! I think you are underestimate the power of your presence. I think Bob gets just as many deposits as he gives. You are lovely. I agree with Jenny! What a wonderful gift you are to each other!! How very wonderful. All of it. That Bob takes such great care of you, that you do weekly picnics and this fun bag. I'm thinking that there are plenty of deposits already in place to last a lifetime...on both sides.